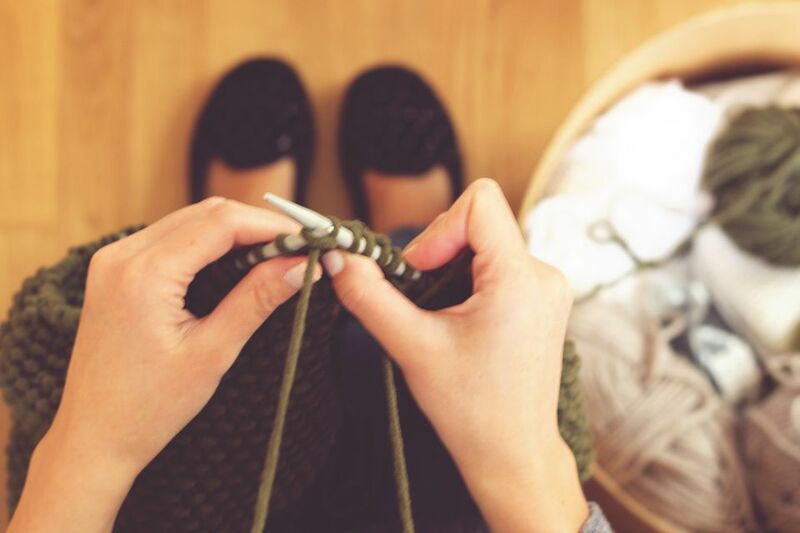 It's hard to believe that something you enjoy doing could potentially be painful, but when it comes to knitting, for some people there is such thing as too much of a good thing. The problem is known as repetitive stress injury, or RSI for short. You've probably heard of carpal tunnel syndrome, which is a particular RSI often but not always caused by working on a computer for long periods. RSI is a more general term for conditions of the arms, wrists, neck, shoulders and/or back caused by repeatedly performing a motion, often in a way that is not comfortable or correct for your body. Knitters with RSIs tend to have problems in their wrists, backs, hands, necks, or any combination. Their problems can be caused by sitting for long using poor posture, gripping the needles too tightly or putting too much weight on the wrists with a large project. Set a timer. Take a 10-minute break every half hour or 45 minutes. Get up. Walk around, do some stretches, have a drink of water (hydration helps keep joints healthy), and stop when you feel tired. Use circular needles for big projects. Afghans, long scarves, and sweaters are heavy, and holding the whole project on one straight needle puts a lot of strain on your wrists. Using a circular needle, even if your project is straight, will help distribute the weight and make your wrists happier. Use fat needles. Large needles are easier to grip and will put less strain on your hands than small needles. Of course, not all projects can be accomplished on large needles, but if you've had an injury in the past, it can't hurt to choose projects worked on large needles, which will be easier on your hands. Sit up straight. Posture is important when you're sitting for long periods in the same position. Sit up straight, keep your feet on the floor, and remember to take breaks. If you have had RSI problems, you can also prop your arms on pillows or armrests to further support the body and distribute the weight of your project. If you feel any of these symptoms, stop knitting right away and put an ice pack on the affected area. If the ice doesn't help, take ibuprofen. If the injury is severe, a visit to your doctor may be in order. Pain pills can be prescribed, or your doctor can recommend other treatments such as wearing a wrist brace at night (it is usually not recommended to wear a brace while knitting, though therapeutic gloves intended to improve circulation may be helpful). If you have an RSI injury remember to rest. Take a few days off from your crafting and use ice and whatever other treatments your doctor recommends. After a few days of rest you may be able to knit for short periods daily, but don't overdo it. An injured hand (or wrist, shoulder, elbow or back) can be reinjured much more easily, and with enough damage, you could be sidelined for weeks or even months. So take it easy, take care of yourself and be mindful of the damage you could be doing when you craft for long periods.